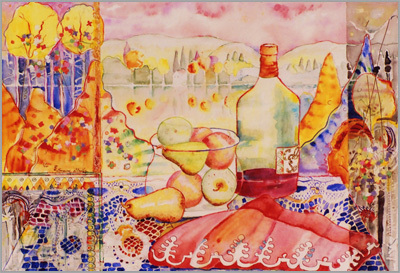 Have a glass of wine and some cheese and enjoy a Lorraine Strieby painting...or a print. Lorraine's original paintings brighten any home or office and will brighten your spirit, too. Her giclee prints are available on high-quality paper as well as stretched canvas. In her lighted Southern California Studio, (Los Angeles or San Diego County -Oceanside), she will embellish a print, making them original prints. These prints are just like the original, showing her sense of style, design, shapes, and color, and they can be on paper or canvass. Just tell her what size and she can embellish it just for you. And, of course, they are signed and numbered. 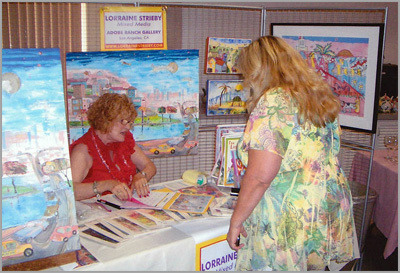 Feel free to reach Lorraine Strieby any time via email adobeart818@eartlink.net or you can call, 818-261-3968.